A CAR RETAILER in Galashiels has been awarded a national accolade by Volvo Car UK. 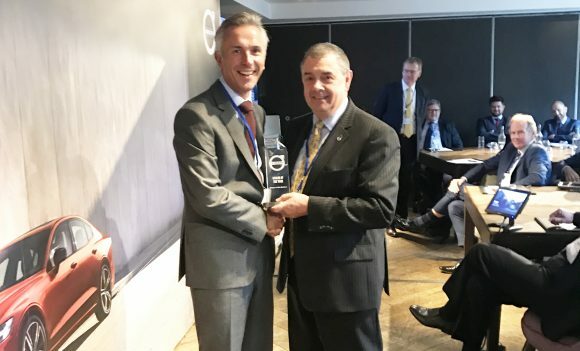 Clelands of the Borders became Volvo’s Retailer of the Year by achieving the best results of 2018. The key performance indicators included sales and growth targets, as well as customer satisfaction scores for sales and aftersales. Volvo said the team at Clelands of the Borders exceeded all targets while seamlessly transitioning to their new showroom, which opened in February 2018. It’s the second time the dealership has won the accolade in the past five years, having also been presented with the trophy in 2013, while in 2017 it was named Regional Retailer of the Year. It’s also the fifth year in a row that it has had a podium finish. Retailer principal John Cleland said: ‘Being crowned Volvo’s retailer of the year for the second time in the last five years is a fantastic achievement. As we are also celebrating our 30th year as a Volvo retailer, we have a lot to be proud of. ‘This award recognises how hard everyone at Clelands of the Borders has worked over the last year. I am so grateful for having such a dedicated team and would like to thank them for all of their efforts – this award would not have been possible without them.